Hmmm. What comes to mind? 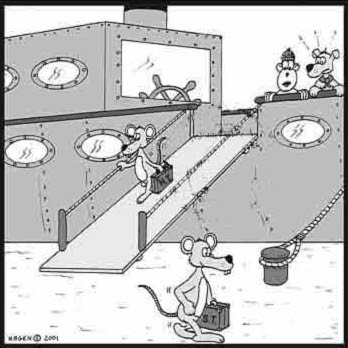 Oh yeah, rats and ships. The top aide to U.S. Attorney General Alberto Gonzales resigned Tuesday amid revelations that White House staff initiated the decision to fire federal prosecutors. A statement from the Justice Department confirmed the resignation of Kyle Sampson, who was Gonzales's chief of staff. Sampson may be called to testify before the Senate Judiciary Committee on the issue of the firings of eight U.S. attorneys. Democrats have likened the dismissals to a political purge and even called for the resignation of Gonzales himself. "U.S. attorneys have always been above politics, and this administration has blatantly manipulated the U.S. attorney system to serve its political needs," said Senator Charles Schumer, No. 3Democrat in the Senate. He said Sampson's departure "does not take the heat off the attorney general. In fact, it raises the temperature." Tho I don't condone Kyle Sampson's complicity in this mess, I do applaud his integrity to walk away from it all. There are many more government employees who are ignoring the problem to retain their jobs. I understand them, but doubt I would not join them. This entire situation is really disheartening. God forbit that the people enforcing our laws have one more ounce of dedication to democracy and protecting civilians than to the president.